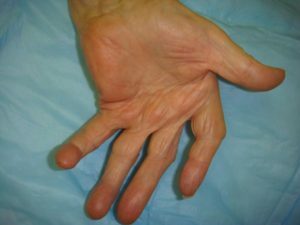 Signs of arthritis of the hand refers to pain, stiffness, swelling, and loss of function. Osteoarthritis results from loss of cartilage and subsequently bone on bone contact that causes the pain. Trauma, overuse, and aging are some of the associated factors. Other types of arthritis related to autoimmune disease such as rheumatoid arthritis may affect not only bone but ligaments, tendons, and soft tissue. Joint instability results in abnormal joint wear and chronic pain. Conservative treatments involve splints, injections, oral medications, modified use, hand therapy or rest of the affected part. doing a partial fusion to eliminate a bad joint. Sometimes just removing a loose piece of bone from the joint or tightening a loose ligament is all that is needed to correct arthritis at the base of the thumb. Each person’s hand needs to be assessed before you will know what treatment you will need. For more information relating to Arthritis CLICK HERE.